Multiple growth of large, acute dipyramidal crystals with very well defined faces and edges and excellent color, very deep. On the sample there is also a colorless transparent crystal of Quartz. A great specimen! Floater Scheelite crystal with well defined faces and edges and rich in parallel and polycrystalline growths. 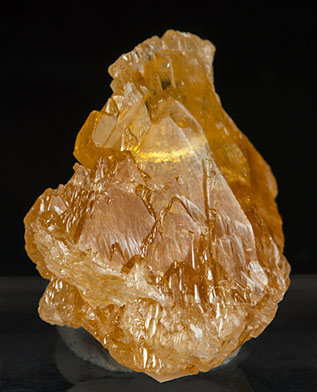 It is translucent to transparent, bright, and has a uniform yellow color with slightly orange shades. 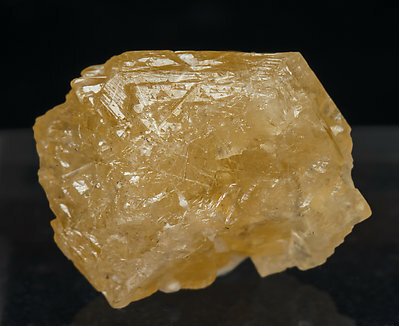 The sample is from the most classic Spanish locality for Scheelite and this one has been recently found thanks to local prospector’s diggings. Complete floater crystal with some well defined faces and edges and parallel, polycrystalline and rough growths. It is transparent, very bright and has a honey-yellow color. A Spanish classic, very hard to find today. We’ll send to the buyer an old commercial label that is with the sample. Gemmy, pearly, colorless Scheelite just colored black in some zones. 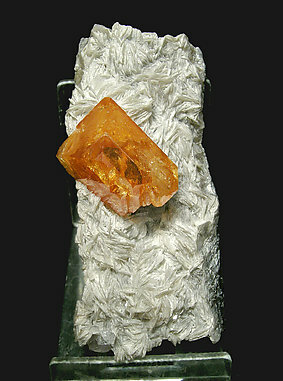 Perfect, sharp and standing upright on its matrix of Quartz partially covered by Calcite. 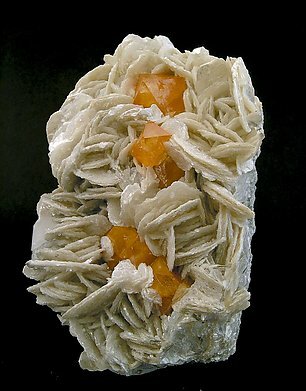 An unusual, lovely, and gemmy Scheelite. Huge, colorful, extremely brilliant and partially gemmy Scheelite. 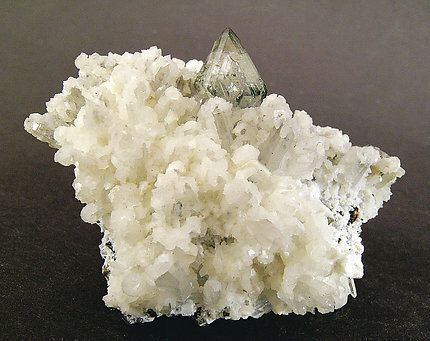 Recrystallized at the bottom with minor Beryl crystals on the right corner. A color-rich Wolfram dream. 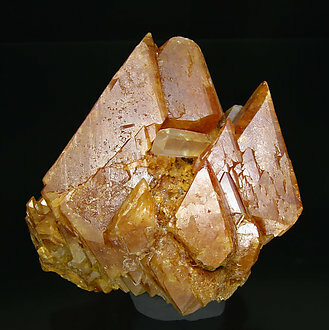 Very large dipyramidal crystal with parallel growths, translucent, very bright and with an extraordinarily intense, deep and uniform orange color. Very sharp floater Scheelite crystal, complete, dipyramidal and with a clear honey color, very much clearer than usual for the Korean samples that usually are dark brown. The sample is from the Joaquín Folch duplicates collection, whose label we’ll send to the buyer. Single Scheelite crystal on a matrix of very well developed dodecahedral Magnetite crystals. 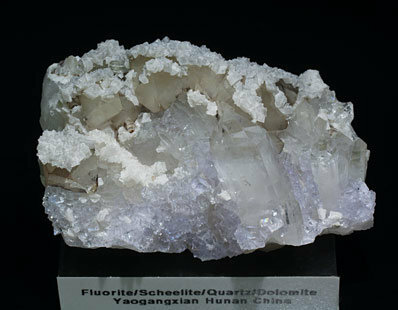 The Scheelite, with a white color and dipyramidal shape, has very well defined faces and edges, is translucent, bright and has noticeable Molybdenite inclusions that create grayish areas that give the crystal a kind of different fluorescence. The sample has been analyzed and we will send a copy of the analysis to the buyer. 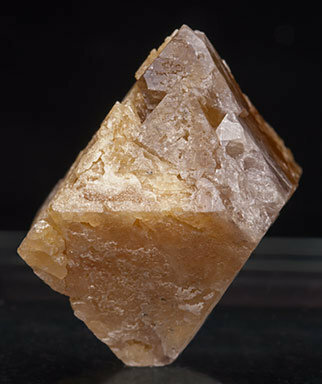 Bipyramidal crystal of a good development of faces and edges, standing on a Mica matrix. Color, brightness and transparency are magnificent giving to the sample a special intensity. The crystals are not that large but they are well defined, well positioned on the white Muscovite matrix, and thus give a good mix of quality and esthetics. 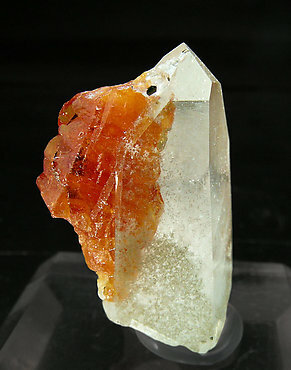 An excellent miniature from a not well known locality for Scheelite with a parallel growth of crystals of very deep orange color and partially included in a translucent crystal of Quartz. Parallel growth of big dipyramidal crystals of Scheelite of excellent color and luster. 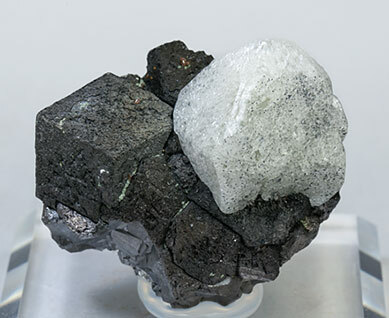 They are on matrix, with Albite and Muscovite. Dipyramidal translucent Scheelite crystals, very rich in faces, with a very clear green color. They are on matrix with an amphibole. 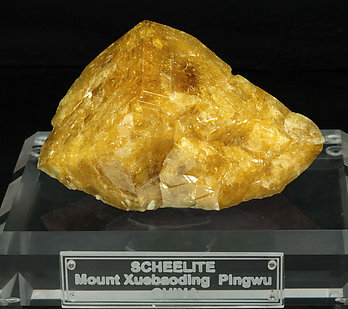 The Scheelite is intensely fluorescent under a short wave ultraviolet lamp. 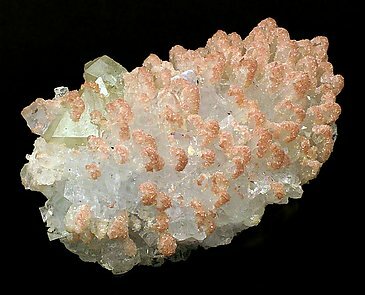 Little or nothing of this has been previously seen, the Scheelite from this locality can be considered as a kind of novelty in the mineral world. Pyramidal transparent Scheelite crystals, one of them clearly dominant, with a very clear yellowish-green color. 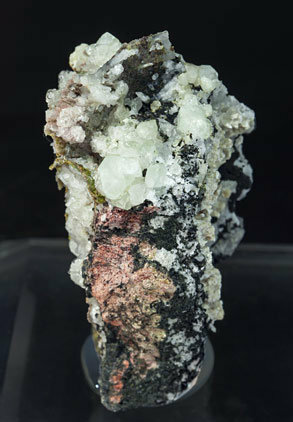 They are on matrix, with Andradite, Epidote and Chlorite. 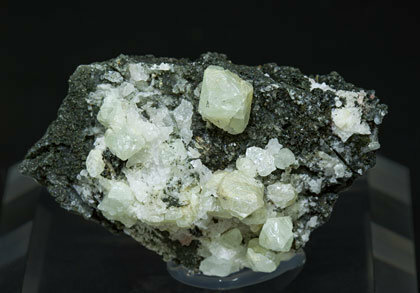 The Scheelite is intensely fluorescent under a short wave ultraviolet lamp. Little or nothing of this has been previously seen. 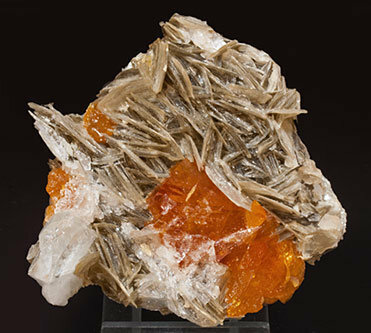 The Scheelite from this locality can be considered as a kind of novelty in the mineral world. 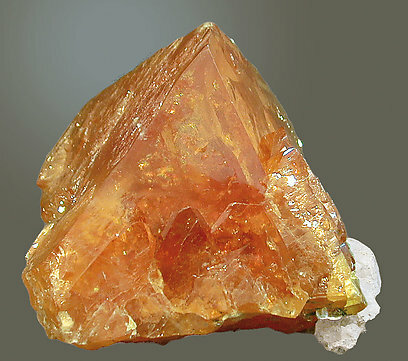 Group of very sharp dipyramidal Scheelite crystals that are translucent, extraordinarily bright and have an unusually intense and deep orange color. They are on matrix with platy Muscovite crystals and flat, transparent Beryl (goshenite variety) crystals. 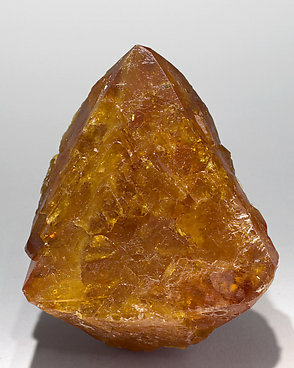 Dipyramidal Scheelite crystal, of sharp faces and edges, intense brilliance and deep honey yellow color. On a Muscovite matrix and tabular Beryl crystals accompany it. This kind of specimen of especially high quality, as in this case, is increasingly scarce. Single dipyramidal crystal with very well defined parallel growths. It is translucent, very bright and has a very intense color. The sample, of large size and great quality, is very much better than the images shown because the color is highly saturated and, so, in the photographs the transparent areas are very difficult to reproduce. An esthetic miniature from a locality already historic. Its crystals have the dark tones typical of Korean samples, they have very well defined faces and edges and are very bright, with small coatings of white rhombohedral crystals of Calcite. This crystal of Scheelite is surprising for the brilliance of the faces and edges of the double pyramid, as well as for the unusual blue color and level of transparency. 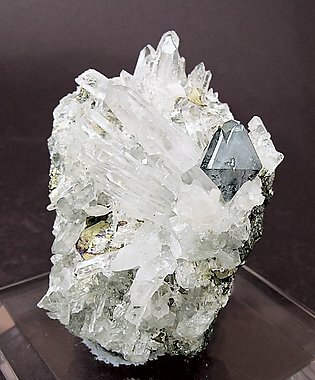 The position of the crystal on the Quartz and Chalcopyrite makes it even more esthetic. Pyramidal transparent Scheelite crystals, one of them clearly dominant, with a very clear yellowish-green color. They are on matrix, with Chlorite. 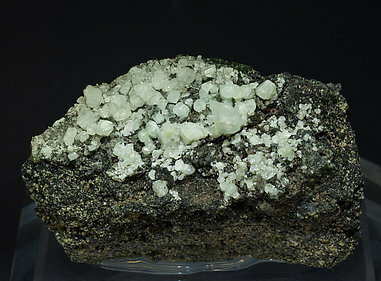 The Scheelite is intensely fluorescent under a short wave ultraviolet lamp. Little or nothing of this has been previously seen. 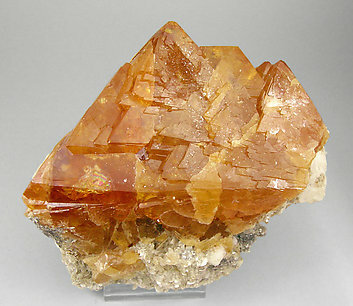 The Scheelite from this locality can be considered as a kind of novelty in the mineral world. 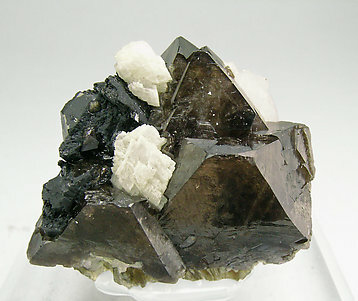 Parallel growth of sharp and bright dipyramidal crystals that contrast with the snowy white color of the Dolomite matrix. Great quality for the locality. 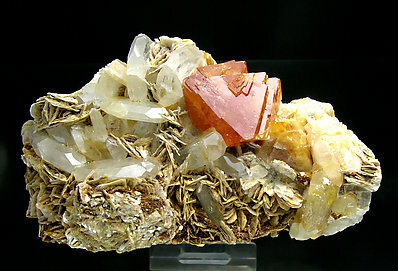 An uncommon paragenesis combining a matrix of cubic crystals of colorless Fluorite, yellow octahedrons of Scheelite and pink Dolomite covering Quartz. 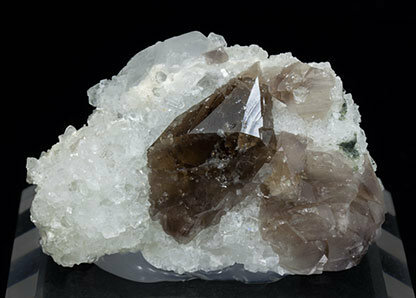 Very sharp, translucent and almost colorless Scheelite crystals on an aggregate of transparent small, cubic, Fluorite crystals with a clear lilac color, with Quartz crystals and partially coated by rhombohedral Dolomite. Unusual association for this “modern-classic,” from a mine which has not produced samples of quality for a long time. 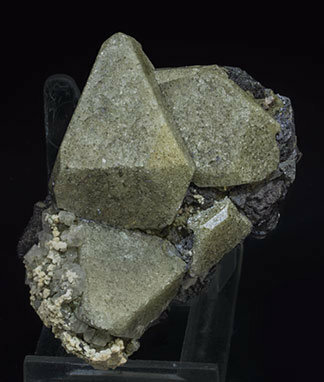 Dipyramidal Scheelite crystals with a very good smoky color, an unusual shape, flattened and with parallel growths, with very well defined faces and edges, very bright and on matrix, with Quartz, Calcite and small cubic Fluorite crystals. A group of dipyramidal translucent Scheelite crystals with very well defined faces and edges, and with a very unusual bright greenish color. 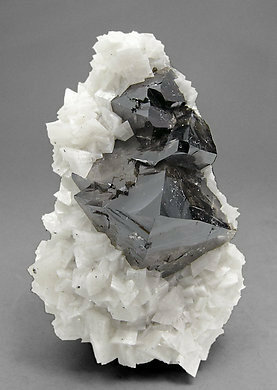 On a crystalline Magnetite matrix, with Quartz and small carbonate crystals.